Begun in 2014, Formula E holds an advantage over other racing championships, including NASCAR and F1, being able to bring racing to major metropolitan cities. The electric cars can wind in and out of city streets rather than on a predetermined track miles from city limits, all while promoting zero-emission transportation as the fight against climate change rages on. Cities, states, and business around the world have banded together in an effort to combat climate change, encouraging consumers to purchase zero-emission vehicles as well as calling upon automakers to develop an “endgame” for cars burning fossil fuels. New York City, Paris, Milan, Pittsburgh, Mexico City, and others are invested in the promotion of electric or fuel-celled vehicles as part of the Zero Emission Vehicle Challenge. Formula E, as it proudly boasts, is driving the future. The race series debuted in the United States in Miami and Long Beach during its inaugural season in 2014/15, but shifted to the tri-state area beginning in the 2016/17 season. 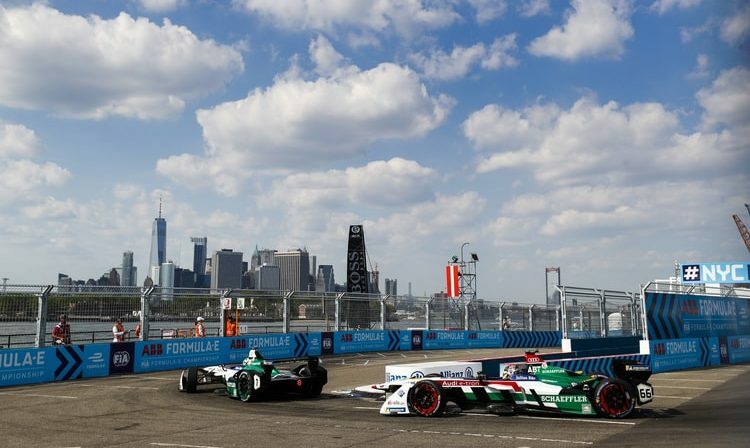 The NYC doubleheader, which takes place at the Brooklyn Cruise Terminal in Red Hook, has concluded the past two Formula E seasons. Actually racing in one of New York City’s five boroughs was a major key when determining a location for the New York City E-Prix, according to USA Today. Michael Hopper, an advisor to Formula E for the NYC race and former sports commissioner for NYC mayor Michael Bloomberg, said the series didn’t want to have a race in somewhere nearby like New Jersey yet still promote it as New York. F1 and FIA, motor racing’s governing body, spent decades trying to schedule a race in the Big Apple. An event was scheduled in the early 1980s, but a location was never finalized. Spots in New Jersey and Long Island were evaluated, but the event fell through. F1 then attempted to hold the Grand Prix of America in New Jersey in 2012, but contract disputes resulted in a litany of postponements with the potential race idea being scrapped two years later. Formula E’s race in New York City sold out both days in 2016/17 and had large crowds this past weekend when it returned. The series crowned its fourth different champion in as many years as TECHEETAH’s Jean-Éric Vergne won the Drivers’ Championship on July 14. American fandom aside, bringing Formula E and electric vehicles to a U.S. audience is something Piquet Jr takes pride in because of the country’s acceptance and support of EVs. Nearly 200,000 electric vehicles were sold to American consumers in 2017. Located south of the Outer Banks, the Crystal Coast boasts 85 miles of beaches and towns. Veteran surfer and local shop owner Mike Crews provides the inside scoop on the area’s surf scene. Former NBA player Greg Ostertag and his wife Shannon have invested more than $2 million in restoring Mount Vernon, Texas. The small town has a population of less than 3,000 and is located 100 miles northeast of Dallas.